It has been a long time since I posted on my blog. I know, I know, the last time I posted was about E3 2018. But it seems as if I try new things and well they just don't pan out for me. Like my "Thoughts On" series or my "Games worth buying under $30" series. I just don't feel it and go back to writing reviews, which I have been submitting to GrownGaming.com instead of here. I really like that site, and it has a stronger reader base then my blog here. Though I'll be posting less and less on my blog I don't have plans to shut it down or anything. I plan to do a post about BlizCon 2018 coming up this November. and in the future I plan on posting again about another theme park I'll be creating in Planet Coaster. I was hoping to do a series of posts on the Jurassic World game that came out over the summer. But that game just doesn't allow as much customization as Planet Coaster does. So I'll am stopping the little series I keep trying to turn into something. My reviews and previews can be found from now on at the site GrownGaming.com. 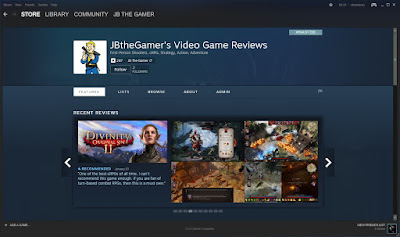 So please, check that site out for all your gaming needs, the owner of the site has put a lot of work into it and I put a lot in my reviews and previews of games there. Till next time, keep gaming my friends.